An international collaboration of neuroscientists just published in Nature a new process demonstrating how neurons communicate to the visual cortex by tracing individual neural projections across the brain. In classical models of our visual system, information flows from a 'primary' visual cortex to more specialized, downstream areas which focus that image's movement or form. However, details of how individual cells carry such information were unclear. Professor Tom Mrsic-Flogel, Director of the Sainsbury Wellcome Center, Project Leader at Biozentrum at the University of Basel, and one of the senior authors of the Nature paper comments: "Understanding the fine-scale anatomy by which individual neurons distribute signals to their targets is a crucial step for forging the relationship between neuronal structure and its function." Up until now, it remained unclear whether information transfer from the primary visual cortex was largely "one neuron - one target area", or if individual neurons distributed their signals across multiple brain areas downstream. 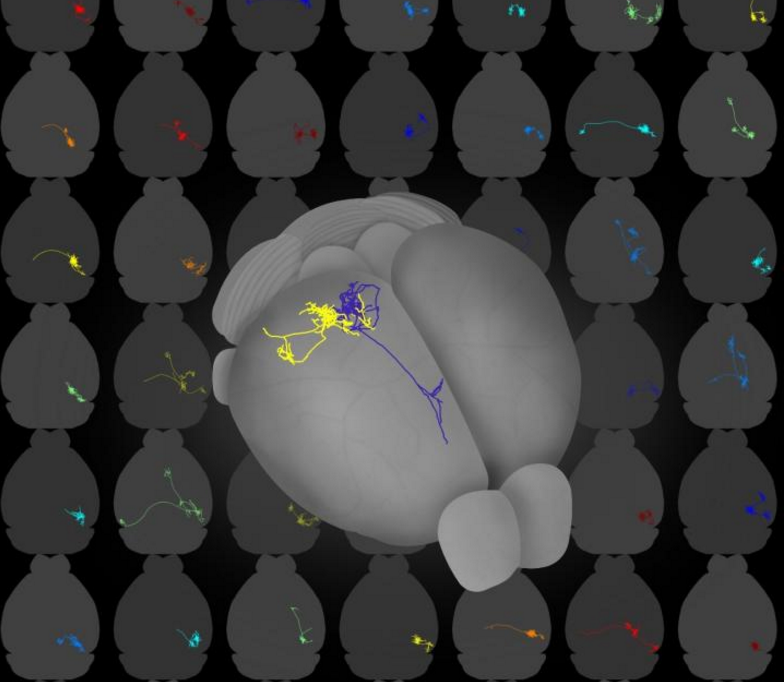 While research, conducted by neuroscientists from the Sainsbury Wellcome Centre for Neural Circuits and Behaviour, in conjunction with Cold Spring Harbor Laboratories and researchers at Biozentrum, confirms the existence of dedicated neural projections to certain cortical areas — also found were a majority of primary visual cortex neurons broadcasting information to multiple targets. Justus M. Kebschull PhD, Cold Spring Harbor Labs, and one of the first authors. In the Nature paper, the team outline the two complementary methods they used to map the projection patterns. First, they used whole-brain fluorescence-based axonal tracing by labelling neurons in the right visual cortex of each mouse with green fluorescent protein (GFP) — a protein composed of 238 amino acid residues that exhibits bright green fluorescence when exposed to light in the blue to ultraviolet range. Then second, they imaged axonal projections using whole-brain serial two-photon tomography. The Allen Mouse Brain Reference Atlas was used to identify brain areas where axons terminated. In the mouse, neurons in the primary visual cortex project over a highly diverse area with 2/3 of the neurons being distributed over multiple areas rather than projecting on just one target. They are called 'broadcasting neurons'. Also, researchers used high-throughput DNA sequencing MAPseq ((Multiplexed Analysis of Projections by Sequencing) to genetically barcode neurons and determine whether they broadcast to cortical areas at random, or whether they targeted or avoided specific areas — which would indicate a higher order of structure. Thousands of individual neurons were uniquely labelled in this way, in essence given barcodes. Each labelled neuron then transported that barcode onto its own axons which were then read out by high throughout sequencing to determine the targets of that specific neuron in higher visual areas of the cortex. Professor Anthony Zador, another senior author and project leader at Cold Spring Harbor Laboratory, explains: "The RNA sequences, or 'barcodes', delivered to individual neurons were unmistakably unique, enabling us to determine if individual neurons — as opposed to entire regions — are tailored to specific targets." This data revealed that the majority of V1 neurons project to higher visual areas in a non-random manner. Six projection motifs were identified. These 6 motifs reflect several sub-classes of projection neurons used to distinguish divergent transfers of information from V1 to higher visual areas. Researchers believe their results "suggest a functional specialization of subpopulations of projection cells beyond 'one neuron - one target' mapping." "The next piece of the puzzle will be to understand what each of these projection motifs does for visual processing and perception and how these long-range connectivity patterns are established during development," concludes Thomas Mrsic-Flogel PhD, professor at the Biozentrum, University of Basel, Switzerland and new Director of the Sainsbury Wellcome Centre, University College London, United Kingdom. This illustration captures the diversity of single-cell projections from the mouse visual cortex as revealed by fluorescence-based tracing. Each panel in the background shows the traced axon of a single neuron from the upper layers of the primary visual cortex. The grey outlines are borders of the brain. The foreground brain contains two traced neuron cells overlaid in different colours.